I'll be reviewing The Haiku Anthology (3rd edition) edited by poet and past President of the Haiku Society of America, Cor Van Den Heuvel. Haiku is a form of poetry practised in Japan since the seventeenth and eighteenth centuries, and has become popular in the western world since the 50's when it was discovered and published in the English language. 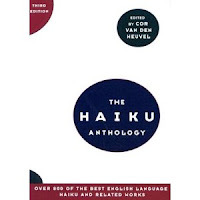 Van Den Heuvel has selected 800 haikus and senryu poems written by 89 poets to include in this anthology. He has chosen poems which mirror the haiku ideals of being present in the human experience and connected to nature. I enjoyed the variety of subject matter within the poems and think he has achieved the perfect balance of topics to interest all readers. (1) An unrhymed Japanese poem recording the essence of a moment keenly percieved, in which Nature is linked to human nature. It usually consists of seventeen onji (Japanese sound-symbols). (2) A foreign adaptation of (1). It is usually written in three lines of fewer than seventeen syllables. The Haiku Anthology (page 330). I would recommend this book to those initiated to the beauty of Haiku as well as those who have not yet been introduced. Cor Van Den Heuvel writes in an accessible style free of jargon which is based on a sound knowledge of his subject matter. He covers the history of haiku and senryu, the growth of the modern haiku movement, and the philosophy behind this art form. I really enjoyed being able to experience such a range of haiku and learnt a lot from the abundance of information accompanying the poems.